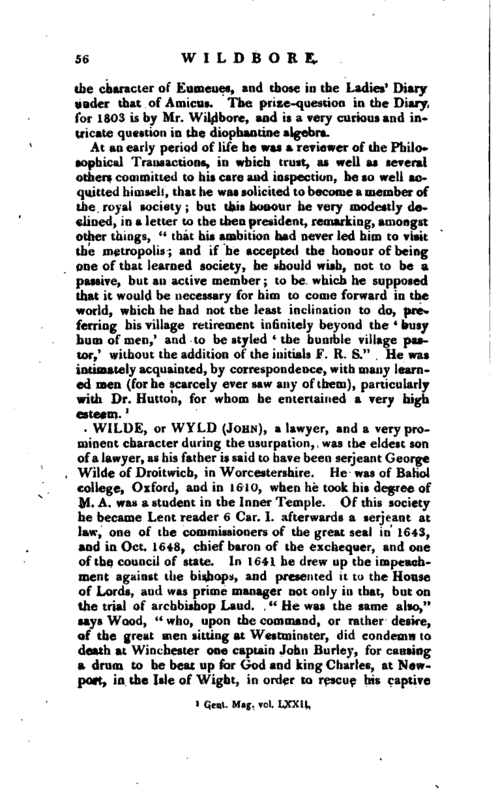 , a lawyer, and a very prominent character during the usurpation, was the eldest son of a lawyer, as his father is said to have been serjeant George Wilde of Droitwich, in Worcestershire. He was of Baliol college, Oxford, and in 1610, when he took his degree of M. A. was a student in the Inner Temple. Of this society he became Lent reader 6 Car. I. afterwards a serjeant at law, one of the commissioners of the great seal in 1643, and in Oct. 1648, chief baron of the exchequer, and one of the council of state. In 1641 he drew up the impeachment against the bishops, and presented it to the House of Lords, and was prime manager not only in that, but on the trial of archbishop Laud. “He was the same also,” says Wood, “who, upon the command, or rather desire, of the great men sitting at Westminster, did condemn to death at Winchester one captain John Bucley, for causing a drum to be beat uf) for God and king Charles, at Newport, in the Isle of Wight, in order to rescue his captive | king in 1647.” Wood adds, that after the execution of Burley, Wilde was rewarded with 1000l. out of the privy purse at Derby-house, and had the same sum for saving the life of major Edmund Rolph, who had a design to have murdered the king. When Oliver became protector ``he retired and acted not,‘’ but after Richard Cromwell had been deposed he was restored to the exchequer. On the restoration he was of course obliged to resign again, and lived in retirement at Hampstead, where he died about 1669, and was buried at VVherwill, in Hampshire, the seat of Charles lord Delawar, who had married his daughter. Wilde married Anne, daughter of sir Thomas Harry, of Tonge castle, serjeant at law and baronet, who died in. 1624, aged only sixteen, “being newly delivered of her first born.” She lies buried in Tonge church, in Staffordshire. 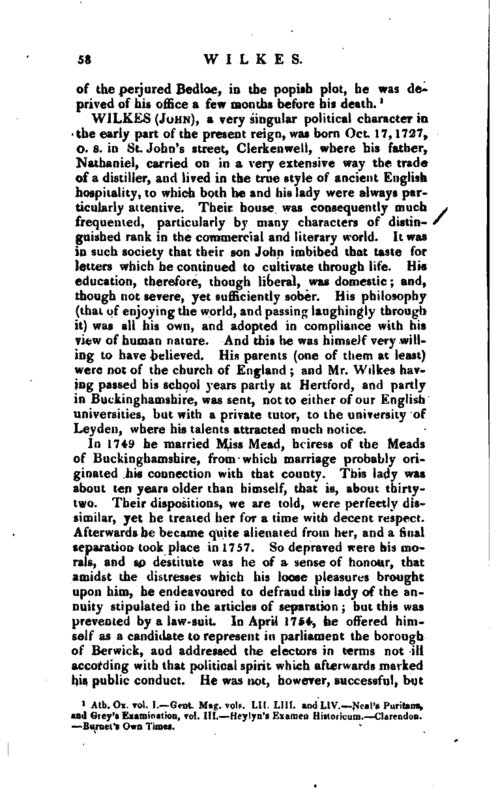 Such are the particulars Wood has given of this lawyer, and they are in general supported by Clarendon and other contemporary authorities, and attempted to be contradicted only by Oldmixou and Neal. Oldmixon’s evidence will not be thought to weigh much against Clarendon’s. Neal calls him "A great lawyer, and of unblemished morals; and after the restoration of king Charles II. 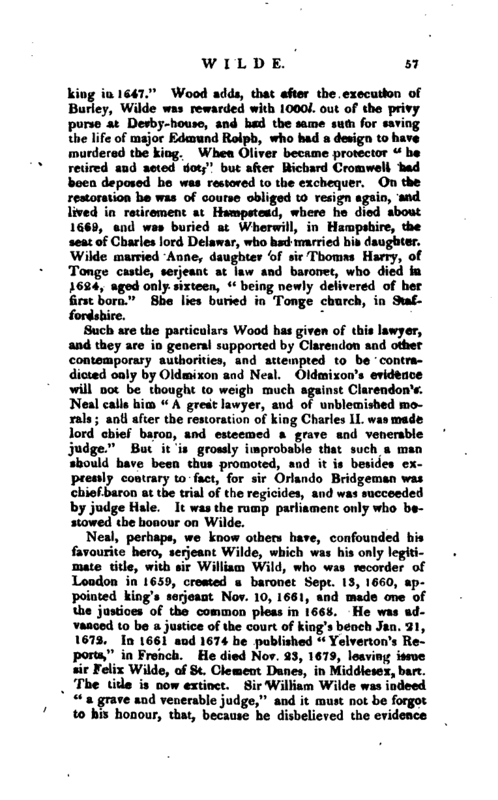 was made lord chief baron, and esteemed a grave and venerable judge.‘ 7 But it is grossly improbable that such a man should have been thus promoted, and it is besides expressly contrary to fact, for sir Orlando Bridgeman was chief baron at the trial of the regicides, and was succeeded by judge Hale. It was the rump parliament only who bestowed the honour on Wilde. Ath. Ox. vol. I.—Gent. Mag. vols. LII. LIII. and LIV.—Neal’s Puritans, and Giey’s Examination, vol. III.—Heylyn’s Examen Historicom.—Clarendon. —Burnet’s Own Times.